Teen beauty starts with natural looking makeup. Somewhere between pre-highschool jitters and a graduation gown lies the need for makeup tips for teenagers. From lip gloss key chains to double-duty application wands, brands such as Mark offer youthful cosmetics and makeup tips for teenagers. Check out department store cosmetic counters and drug stores for other teen friendly brands. If there's one thing that every teenage girl has in her favor, it's those naturally flushed cheeks that all grown women covet. Whether she blushes from her first crush or from cheering at a football game, recreating that look to work full time is easy. A cream blush or a cheek gel in a rosy pink tone will help any teenager flaunt those just-pinched cheeks from the beginning of her first class through the last bell. No reapplication needed. For lips that are shiny and plump, teenage girls look best wearing glosses. Who has time to fuss with lip liners and heavy lipsticks when they're busy blowing bubbles and kissing boys? Bonne Belle Lip Smackers are a staple for any teenage girl. Perfect for the winter season, these lip moisturizers come in a variety of lip licking flavors, some with a metallic tint or rosy peach pigments. Need to take it up a notch for a date night or dancing? Every teen girl should own Clinique's Long Last Lip Shine in All Heart, it's the perfect shade of innocent pink and works on every skin color. For more youth friendly cosmetics check out the cosmetic department store Sephora. The eyes are the windows to the soul, and young gals have eyes that are filled with endless dreams and possibilities. Frame this inner beauty with well-defined and arched eyebrows. 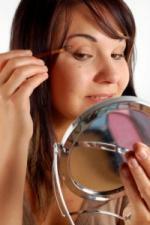 A professional cosmetologist or esthetician can perform the first eyebrow wax. Once the ideal eyebrow shape is obtained, the brows are easy to maintain with a good pair of tweezers in between professional waxing visits. Teenage girls may experiment with all types of eye shadows as long as the colors aren't too bold or harsh. Remember, if the shadow selection is bold, everything else in the makeup palette should be minimal. Young ladies look their best in shimmery makeup. Look for pearlized shadows in shades of ivory, taupe, celadon green or light blue. It's always best to apply a small amount of shadow and blend in the crease of the eye liberally. If using a bold color rather than a neutral, go easy and create a light "wash" of color through the process of continued blending. Harsh colors are not attractive during daytime hours and can be much trickier for a novice to apply. Play it safe by adding just a punch of color to the lips. Eyeliner is optional for teenage girls. Because teens are active, it's not likely that a lined eye will look its best throughout the day. Save eyeliner for evening or formal occasions. Colorless mascaras are the best tool for a teenage gal. Doubling as a brow gel, a few sweeps of clear mascara on the lashes will separate and define lashes without clumping or smudging. Teenage girls are bound to be excited as they shop the world of cosmetics for the first time. Keep the focus on fun glosses, groomed brows and peachy cheeks and the unmatched beauty of youth will shine through without much effort.